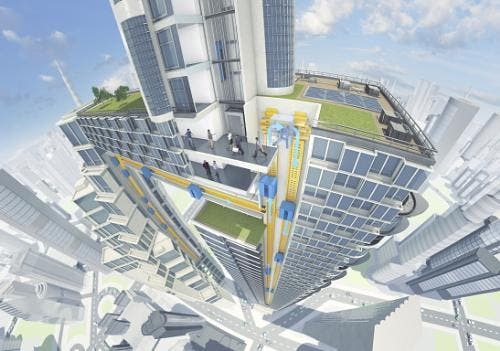 The elevator was invented over 150 years ago, and now, we’re entering a new era in vertical transportation: the first ropeless elevator has been developed. The Germany company ThyssenKrupp developed this technology, and it looks straight out taken from a Willy Wonka movie! But this technology is not about being cool, it’s about being effective. MULTI elevator technology increases transport capacities and efficiency while reducing the energy usage and average wait time for the users. Think about it this way – in a conventional elevator, in a very tall building, the elevator has many potential stops (many floors); basically, anyone at any floor can ask for the elevator and no matter how you program the elevator, every additional floor that elevator serves adds much more time wait time for the users. With express elevators, they stop every X floors, and then the users get transfered to a local elevator, which saves a lot of time and energy – and this is where MULTI steps in. The cabins would move in a manner similar to a metro system–running in a constant loop, giving users access to the elevator every 15 to 30 seconds. The system could also have architectural implications, allowing different shapes in tall buildings, allowing for freedom of structures with different heights, shapes and purposes. The design will integrate self-propelled elevator cabins per shaft running in a loop, increasing the shaft transport capacity by up to 50% making it possible to reduce the elevator footprint in buildings by as much as 50%. Another advantage is the extra space which MULTI will provide. Building design will no longer be limited by the height or vertical alignment of elevator shafts, opening new possibilities for architects. “Using no cables at all, a multi-level brake system, and inductive power transfers from shaft to cabin, MULTI requires smaller shafts than conventional elevators, and can increase a building’s usable area by up to 25%, considering that, depending on the size of the building, current elevator-escalator footprints can occupy up to 40% of the building’s floor space”, the press release writes. “As the nature of building constructions evolve, it is also necessary to adapt elevator systems to better suit the requirements of buildings and high volumes of passengers. From the one dimensional vertical arrangement to a two dimensional horizontal/vertical arrangement with more than one or two cabins operating in each shaft, MULTI represents a proud moment in ThyssenKrupp’s history of presenting cutting-edge transport technologies that best serve current mobility needs”. 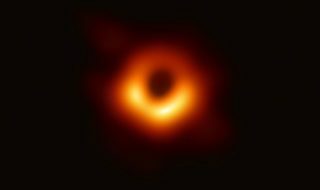 Personally, I find this technology inspiring and I feel that it has a lot of potential, but I’m not entirely sold on their calculations regarding how much energy it would save. Not all buildings are equal, and some have different usage patterns than others, so while it seems clear that it will save energy, I’m just not sure how much it will save. The technology will enter the proper testing phase in 2016.